Remember the book The Giving Tree? If you don't, it's about a tree that gives a boy her shade, her apples, her branches, her wood, and finally, when it seems like she has nothing left but a little stump in the ground, she surprises you by offering her stump for him to sit on. The moral of the story is something about how wonderful it makes you feel to have a best friend for whom you would do anything, and that no matter what, a true friend will always be there for you. The flip side of the story, the message we're not really supposed to take from it, is that no matter how much you have taken from and used something, there is a chance that you can probably take even more. There is no need to quit asking and taking! Just get creative, and surely you will find that there is something more you can force out of it. I think that a chicken is much like that tree. I don't think that Shel Silverstein would have sold quite as many copies if he had written "The Giving Chicken." I just don't think that illustrations of a chicken carcass being roasted, sliced, diced, shredded and finally boiled would have the same effect. But the story is the same. The almighty chicken, staple of dinners all across America, can give us so much more than we usually demand of it. Let's pretend we are that little boy, and we'll take a chicken for all she is worth. It's fun. Because just when you think that your little Henny Penny can't give you anything more, you get to take her lifeless pile of bones and use them up too. It's rather uplifting, no? By cooking a whole chicken, I find I can usually make three to four meals of out it. We will have chicken for dinner one night (with some vegetable sides), a chicken-heavy meal the next night (say chicken enchiladas or chicken casserole), and then a night or two of lightly-chicken-based meals (chicken on barbecue pizza, or chicken in an Asian salad). By this point, I have grown quite attached to Henny Penny and all that she has done for us. Likewise, by this time my family is ready to evict her (and perhaps me too). However, I don't have to give up yet. Henny Penny is just a pile of bones, now. Okay then, I'll use her bones. At this point, I can make a stock. I usually get pretty squeamish picking every little bit of meat off the bones. Since I will be soaking every living bit of flavor out of them, though, I can leave them not-quite-clean and still not feel guilty. In other words, be lazy! It's okay to skip digging cold chicken out of the little nooks and crannies in your chicken's nether regions. The basic premise of stock is that you take a bunch of water, and simmer it with vegetables and bones. The idea is to get every last bit of flavor out of the veggies and the meat, and into the water. When you have done that, you throw away the veggies and the bones, and you save the flavored water. All of those bits you cut off here and there have lots of flavor and lots of nutrients. It is a shame to throw them away, but they aren't very appealing to eat. As you cut off these scraps, throw them in a plastic bag in the freezer. When you have a bag full, or some bones, you are ready to make stock. I usually make stock after I have roasted a chicken. Around here, we eat more vegetables than we do chickens. If my bag of veggie scraps gets full before I have chicken bones, I just make veggie stock. Either way, it is a great way to get one last hurrah out of your food before you give it up for dead. The method is basically the same for either veggie or chicken stock. 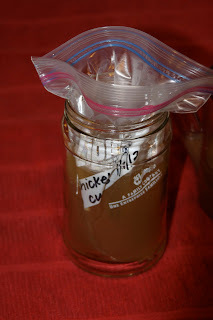 If you are doing chicken stock, you will want to let it simmer for much longer, though. You need time to get all that flavor out from the marrow and the bones. If you are doing veggie stock, cut the vegetable pieces up smaller (almost diced), so they can release their flavor much more quickly. If you are doing chicken stock, keep them larger, so they don't totally disintegrate while the chicken bones slowly release their flavor. In the end, you are going to strain out the vegetables and bones, so you don't want the pieces to turn all to mush. Put your chicken and vegetables in a large stockpot. Cover them with about 4 quarts of water. You can add some herbs if you want (like maybe some parsley, or some thyme). You don't really need to, though, especially if you have a good variety of vegetables. (I often have some little bits of garlic and parsley stems or cilantro stems in my bag of frozen vegetable pieces). You can always add seasoning to the dishes you make later, when you use this stock. Here are my veggies just starting to simmer. Bright green veggie pieces in clear water. Now, just put it on the stove! Let it simmer (not boil) for a good long time. Vegetable stock will be done in about a half an hour, but chicken stock should simmer for a good 2-2 1/2 hours. Stock after a couple of hours... the color has all gone into the water! Once you think the veggies and bones are worthless, you can take it off the stove. guys. We'll always remember you. Strain it through a fine mesh sieve (or some cheese cloth) to remove all the bits and pieces of flora and fauna. Throw those away, and hold on to the hot stock. Let it cool as much as possible before refrigerating. (In the winter, I just put it in the garage -- covered, of course, -- instead of ever putting it in the fridge). You just don't want to put a huge pot of hot liquid in your refrigerator. Your fridge will thank you, your electric bill will thank you, and all the food that would have been adjacent to the big hot pot will thank you. Once it is pretty cool (you can put it outside, in a few smaller pans, or in a bath of ice water if you want to speed things up), put it the refrigerator overnight. This will let it all settle and let the fat separate, and rise conveniently to the top of the stock. If it is veggie stock, there will be no fat to speak of, so you can consider it done at this point. Here is the hot, fresh stock. You can see the fat already gathering around the edges. If it is chicken stock, I like to take the fat out of it. You don't have to, but I think the fat looks yucky and really isn't that great for you. Do this with a fat separator, or by skimming the fat off the top, with a spoon. This one is great because it has measurements on the side, so I can pour it into the bags in set amounts (then I know how much to defrost later for using in recipes). Now, your stock is done! You can use it right away or freeze it for later. I like to freeze it in 2-cup amounts in ziploc bags. I know using a disposable bag isn't the best thing to do. If you have enough food storage containers in the right sizes that you can spare a few to hang out in the freezer, go ahead and do it that way. Otherwise, the plastic bags work great and don't take up much space. Use a cup or a jar to hold your bag upright for you while you fill it. Let them lie flat while they are freezing. Once they are frozen, you can stand them up, lay them down, build card houses out of them.... it's your freezer to organize as you like! If you try this, let me know! I would also love to hear how you use your stock!